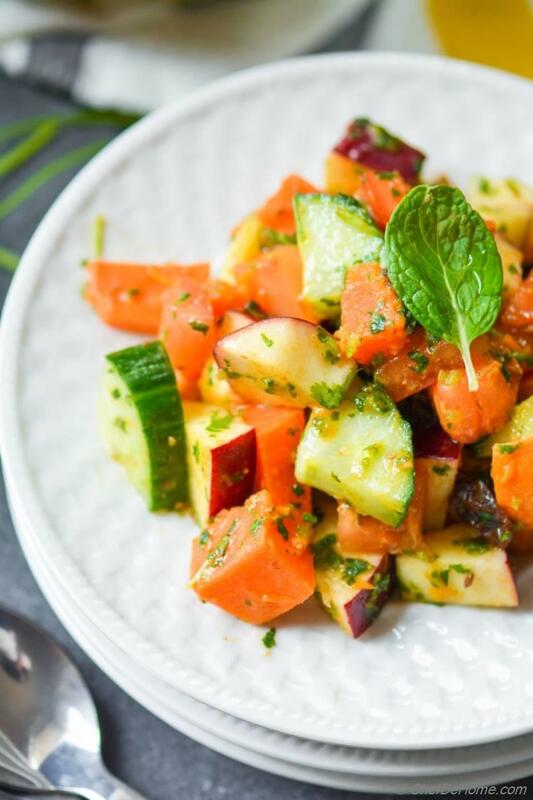 Packed with punch of flavor from mint, this Vegan and Gluten free salad is staple during Navratri Season! 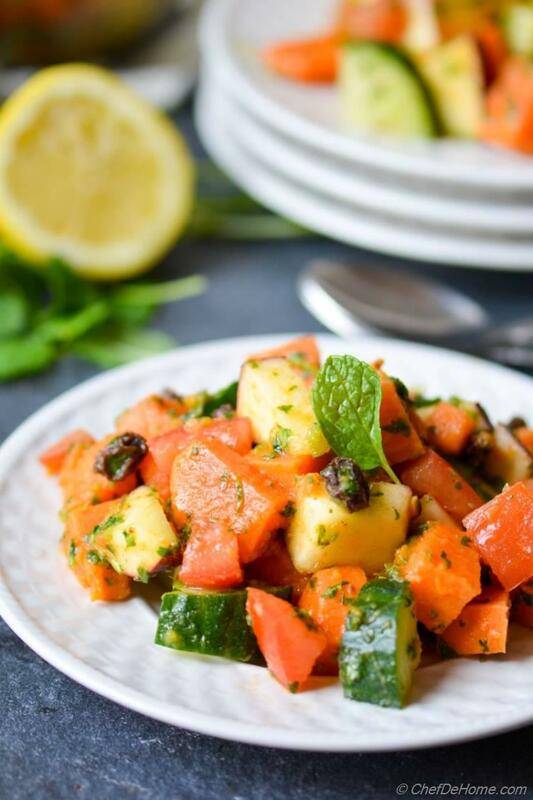 Today, sharing with you a tongue-tantalizing, sweet n' sour, gluten free, sweet potato salad dressed in zesty mint dressing! 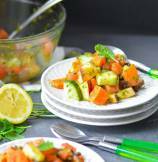 Other, one of such recipe is Mint and Sweet Potato Salad! I'm calling it a "salad" for you, but actually it is a complete mini-lunch meal during Navratri Fasts. Savory foods like these are often finished with a gluten free, egg-free sweet treat. but... you know me, I'm a savory person, I will not be able to cook or share sweets until I have shared plenty of savory... still if you wanna make this mini-meal and serve a sweet treat, you can use my recipe of fasting food - Tapioca Kheer (Pudding). Sweet Potatoes and potatoes are most common source of starch and carbs during those days ( since no gluten or even no rice are consumed.) Potatoes or sweet potatoes (shakarkandi) are added in lot of preparations, for flavor as well as for binding gluten-less flours like Buckwheat. This salad is also made with potato, and is homemade version of famous Indian street food, called Chaat (in hindi). 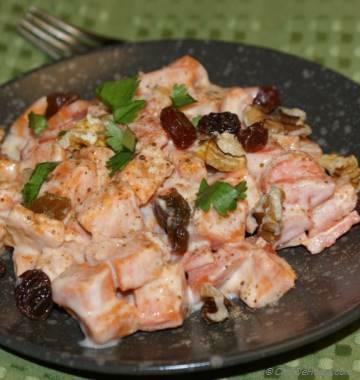 What is so special about this chaat salad? Well, there are many salads all over internet made with sweet potato and cucumber. But! 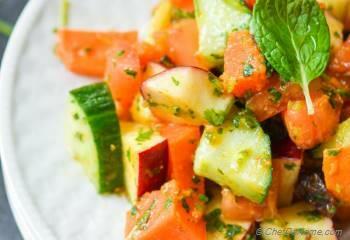 this salad is dressed in a zesty, sweet and sour mint chutney that makes it to die-for! and it is so easy to assemble! Just boil potato, peel and dice. Add you favorite fruits and veggies (like cucumber, tomatoes, apple, grapes, oranges..). Make chutney and slather all fruits in chutney! and you have it! THE best chat-pata (sweet 'n sour) fruit chaat of all times!! No dairy, no eggs, no gluten, yet ton of flavor and make-ahead-life, makes this salad a perfect lunch-in-hurry or a filling mini-meal. I hope you like the look and taste of this ever green Indian staple! with hope to share some more.... I wish you a Great day ahead! Make some buckwheat flat bread and tapioca kheer for a delicious fasting meal! Total Time 20 minutes Prep Time 10 minutes Cook Time 15 minutes Difficulty Easy Yields 2 Servings Serves 2 Notes 2-3 substantial or 4 small servings. 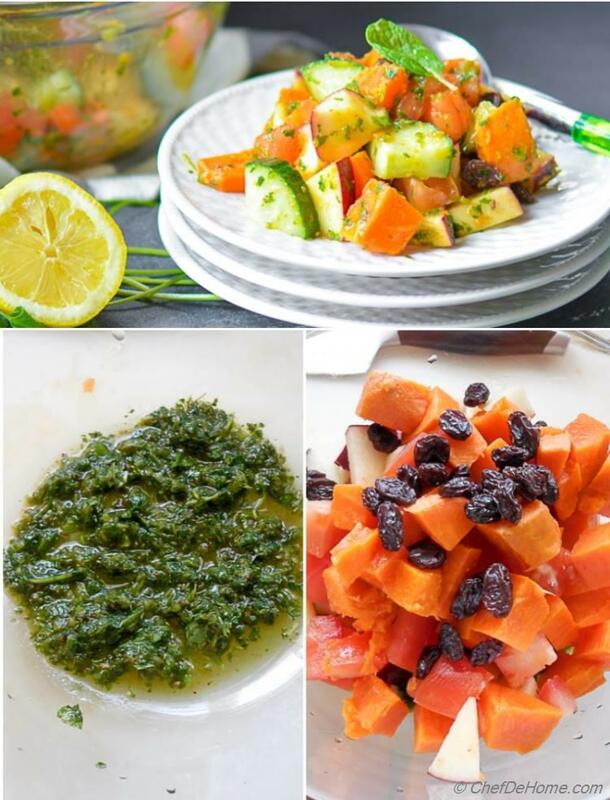 Smart Swap You can use boiled potato or ripe banana in-place of sweet potato! 1. Boil or steam sweet potato until knife tender. 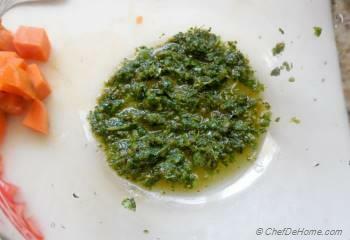 (about 15 minutes if boiling) While potatoes are boiling, in a food processor jar, add rough chopped mint, cilantro, and all other chutney ingredients. Process everything to a coarse paste. If not using oil, scrap the bowl once or twice to make processing easier. 2. Transfer chutney to a wide bowl. 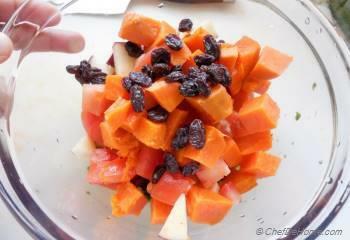 Add peeled and diced cubes of sweet potato, cucumber, tomato, raisins, and apple. and toss to coat everything in chutney. 3. Garnish with some fresh mint leaves. Serve chilled or at room temperature. Save time!! while sweet potatoes are boiling, you can ready chutney and dice all rest of ingredients like apple, cucumber, and tomato. I had to make it for 12 people, so it was a bit more time consuming, but I think the unique, interesting taste will make it worth the effort! Thanks for such a delicious recipe! thanks Thalia, Medha, and Cara! much appreciated! What a refreshing, light and delicious salad! I have all the ingredients for it on hand - so I must make the recipe. Yum! This looks so delicious! I love the combination of sweet and crunchy in this salad. Manali, you are right, in-fact this chutney tastes yumm on it's own! everything is better with that chutney! 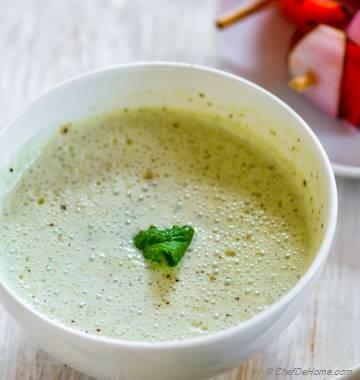 Yum, love the recipe Savita! :) thanks, Anupama! When we visited market in India, this chaat was one of my favorite to snack! Ritu, thanks! sure! do try! I'm sure you will love it! 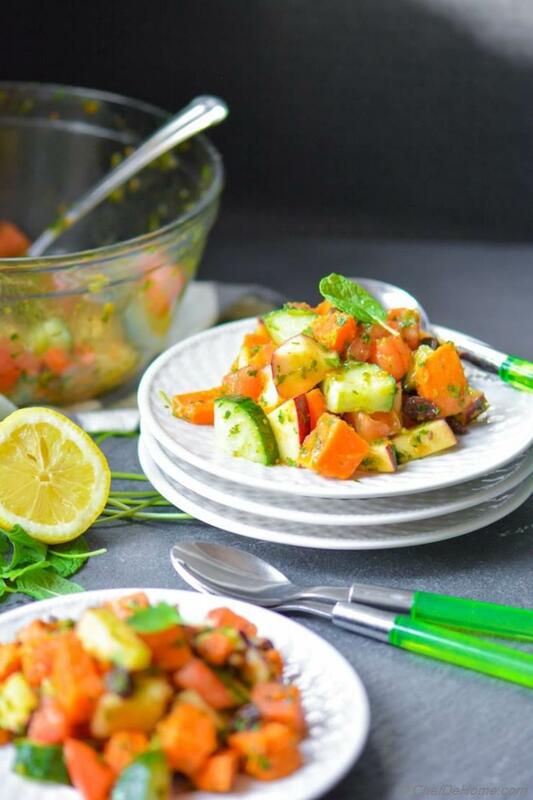 Lov the freshness of this salad and pictures are gorgeous! Pinned! 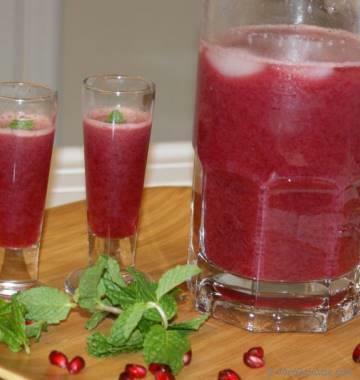 Savita this looks so delicious!! I remember eating shakarkandi chaat from street vendors!! Yumm! Gingi, thank you so much! It indeed is a delicious way to eat sweet potato! It is so yummy!! I would not want wait till the vrat time to enjoy this.. NOM NOM! !